“What’s a typical day for you?” This was the question casually asked of me at girls night in this week, as six of us gathered around my humble dining room table to peel sweet potatoes, make peanut sauce, and find our way to animated, hilarious, and insightful discussions of career, marriage, and kitchen tools. If you’re self-employed, you probably know that the cliché answer of, “there is no typical day” is true. I wish my days always consisted of beginning with a workout, consuming today’s garlic cheddar biscuit breakfast sandwich and a ginormous iced coffee, then proceeding to blog my heart out all day without a care in the world, but it’s much more of a struggle than that. I know, I’m sounding like a complainer right off the bat, but hear me out. My enlightened thought on the whole thing lately is that I’ve spent my entire life, literally, going through the same morning routine. To some tune or another, it’s always been wake up, eat breakfast, make myself look semi-presentable, get out the door to school or work. 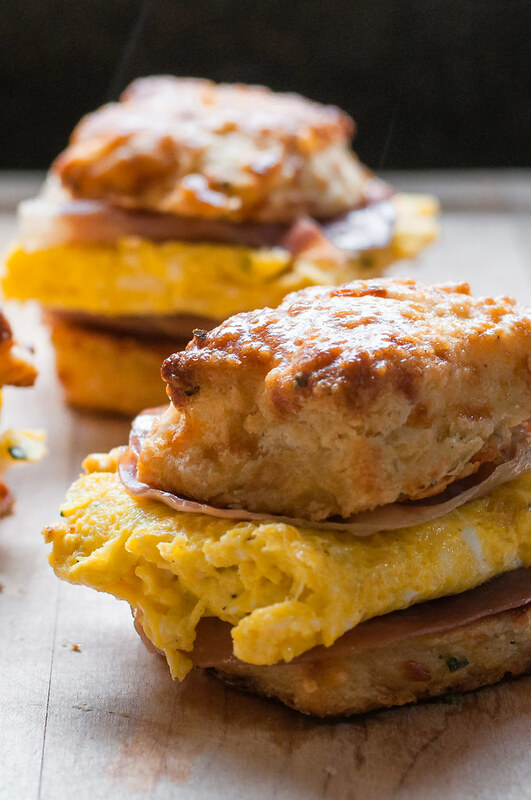 Now, suddenly, no one is demanding that I wake up to make and photograph biscuit breakfast sandwiches, design a logo, search out and connect with clients, or learn how to code a website, yet all these things “need” to get done. Every day is an exercise in self-motivation and focus. My struggle is this: I have 47 things on my to do list for a given week. How do I stave off anxiety and/or enthusiasm for 46 items while I choose the most important one and sit down and do it now. Uninterrupted. To the best of my ability. Until it’s finished. What if I picked the wrong thing first??? Something tells me that, at least for my personality type, rising early with a loose routine has the potential to revolutionize my day. This is not the part where I tell you that I’ve started a practice of waking at 5 am and it’s working wonders. Nope, not even close. I cannot break my habit of working until 1:30 am multiple nights in a row, which makes early mornings difficult. I have taken some baby steps, like cleaning up the kitchen, my biggest morning distraction, before I go to bed, so it’s not there to tempt me in the morning. Or, instead of frantically hopping out of bed and running downstairs to make Steve’s smoothie when I hear him get out of the shower, I get out of bed ten minutes earlier, when he does, so I can brush my teeth, make the bed, wash my face, and feel a little more peaceful as I send him off to work with a green drink. Other days, when my mind is in a million places before I even get out of bed, I get down to a few minutes of yoga to slow my breathing and start the day strong. Maybe half the time, I stick to my resolution to stay off social media while I’m still in bed, keeping negativity and superficial self-esteem boosts at bay. Other days, I consciously make breakfast and coffee and sit down to read, without a screen in sight. Bottomline is, I haven’t really figured out if regimented mornings or days are the way to go for me. They don’t account for unscheduled bursts of creativity (or unscheduled creativity droughts), which is becoming much more important to my livelihood. Strict routines also don’t accommodate saying yes to people and spontaneous opportunities. My guess is, I won’t have to wait to the end of my life to realize that these two things are the stuff real life is made of, and how amazing that I have the flexibility to seize them now. 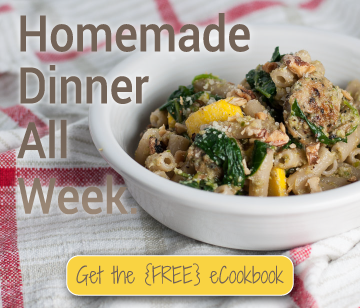 Looking at my pages of ideas, I know I love to blog, and it’s the best feeling to see that more and more people like to read my posts and try my recipes. On the other hand, in probably five or ten years, blogging, Instagram, facebook, and the like could well be archaic relics of the past. Sooner or later, likes and pageviews and ads and sponsored posts won’t be more than a distant memory. Regardless of how this morning routine thing pans out for me, I’m going to try to think that thought as I continue to build a living, but also a life. This is the part where I try to make a smooth transition from the meaning of life to a garlic cheddar biscuit breakfast sandwich. All I can really come up with is that the biscuits are mildly life-changing. 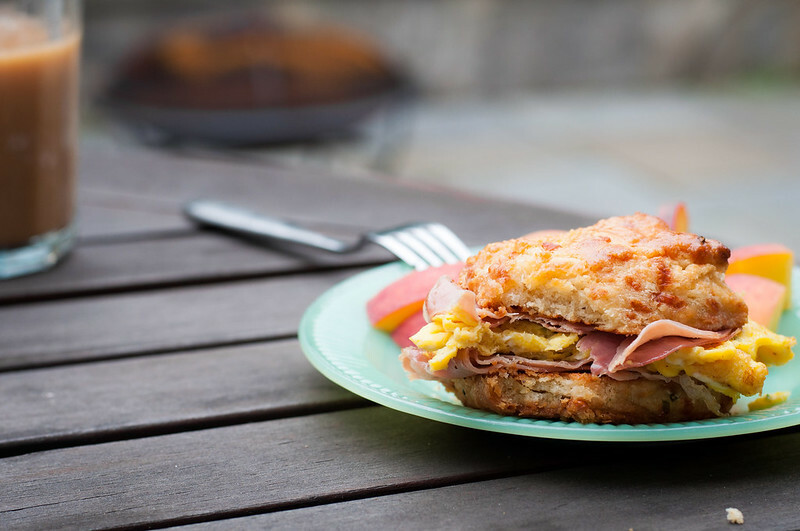 Just as once-in-a-lifetime opportunities and encounters beg us to let go of routine, piling this cheddar biscuit with mayo, chive garlic butter, fluffy fried eggs, seared prosciutto, and more butter demands temporarily forgetting about health and longevity. Okay, maybe that worked. After testing the cheddar biscuits on our friends at Connect Community, I knew they were destined for great things. Or that everyone arrived starving and couldn’t discern a good biscuit from a bad one. Having taste tested one (um, or two) Saturday night before feeding them to everyone else, I was pretty confident in my performance. Or should I say Ina’s performance inventing the original recipe in the first place. All that aside, I snatched the last biscuit at church before anyone else grabbed it and wasted no time in building this biscuit breakfast sandwich for my famished guitar player when we arrived home. If I wasn’t sure before, his reaction–hoarding the sandwich in the corner with eyeballs rolling back in his head–said it all. We had a winner on our hands. Even better, we had a winner that makes brunching easy. Despite all the online chatter about the inferiority of day-old biscuits and all my fussing over a storage method, these ones thrived into the second and even third day. Just cool them completely and throw into a sealed plastic bag or other airtight container. If you make them more than 12 hours ahead, put them in the refrigerator. When it’s brunch time, slice them in half, slather them in mayo or butter, then brown and crisp the surface on a hot griddle. While the outside browns, the cheesy inside of the biscuit has plenty of time to get warm and steamy, and it tastes like it was baked immediately before sandwich assembly. Voila…more compliments and sleep for you. Prosciutto is totally optional. 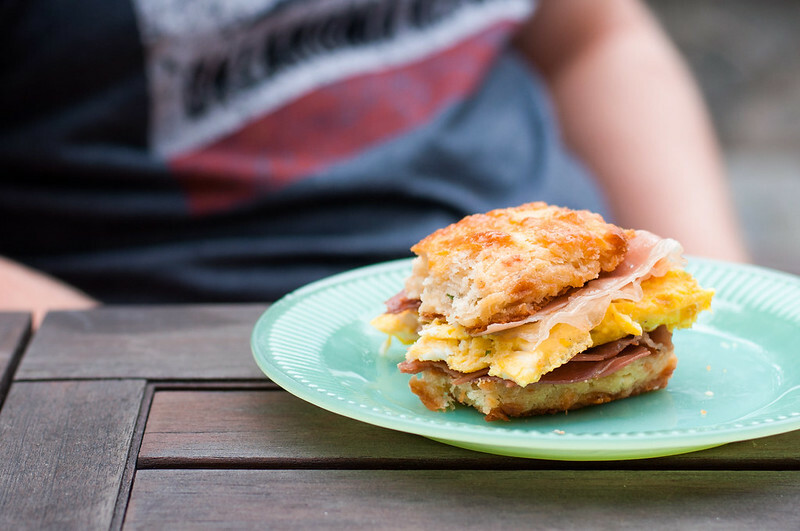 I admit this was a rare occasion on which I had a bite, meat and all, but when I made the biscuit breakfast sandwiches again in Maine (where the photos took place) over the fourth of July, I left it off mine to keep it meatless. You may also gripe that there is not cheese on these sandwiches, but it’s all part of the plan. The biscuit itself is chock full of cheddar and, if you’re smart, Gruyere, too. 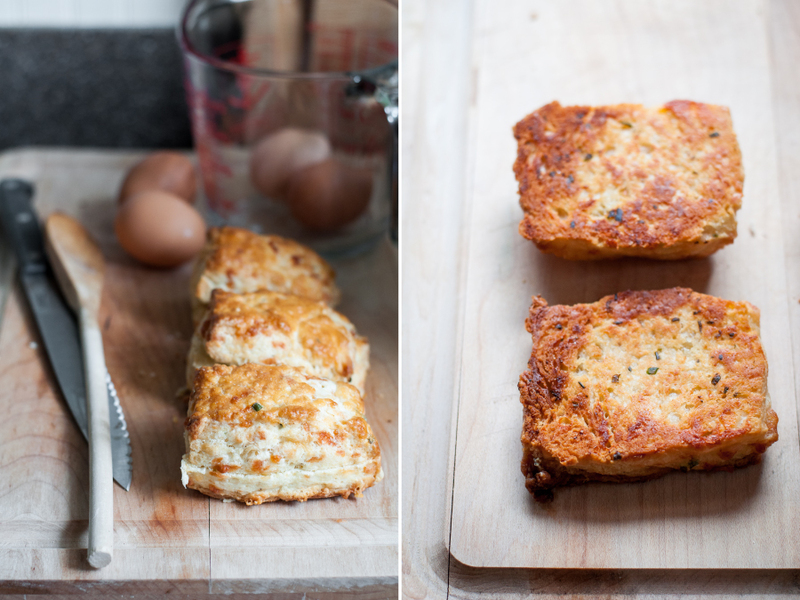 So save yourself from messy, gooey assembly and just keep the cheese in the biscuit. Or add some more. Up to you. Just don’t mess with the key components: cheddar biscuit, garlic butter, fried egg. Deal? Cut cold butter into ½" cubes (freeze it for a few minutes first if kitchen is warm). Beat buttermilk and extra large egg lightly in a liquid measure or small bowl. Toss grated cheese and chives with about 1 tablespoon of flour to coat. Refrigerate butter, egg mixture, and cheese until needed. Preheat oven to 425 degrees (F) with rack in middle and line a half sheet pan with parchment or a silicone mat. Set up a stand mixer with whisk and have paddle attachment ready. Clean and lightly flour a large board or countertop workspace and lightly flour a rolling pin. Beat remaining egg with a tablespoon of water and set aside. In mixer, whisk flour, baking powder, and salt on low to combine. Add cold butter and whisk on medium low until butter is in pea size chunks, about 1 to 2 minutes. Switch to the paddle attachment and add buttermilk mixture all at once and mix on low until barely combined. With mixer running, add cheese and chives and mix briefly until a cohesive dough has just formed. If there are some loose crumbs or flour in the bottom of the bowl, they can be incorporated while kneading. Turn mixture out onto prepared floured surface and press it all, including any loose or dry pieces, into a single mass. Knead mixture about 6 to 10 times, each time pressing it down with the heel of your hand then folding the farthest edge back toward you, until combined well but still cold. Resist the temptation to keep kneading, or you may end up with flat, dense biscuits. Press dough into a short log, then roll out to a thick 10 by 5 inch rectangle. Using a knife or board scraper, cut straight down to divide dough in half lengthwise, then crosswise into quarters. Place 8 biscuits gently on prepared baking sheet, brush liberally with reserved egg wash, and bake 20 to 25 minutes, rotating the pan once if your oven cooks unevenly in front and back. Biscuits are done when risen and fluffy and just golden. Cool a minute or two on pan then transfer to a wire rack to cool completely. Make sure butter is very soft. Using a fork, or in a food processor or electric mixer, mix in ½ teaspoon garlic salt to start, and the chives. Taste (on a scrap of bread, if you have one handy) and add more garlic salt as desired. Refrigerate butter in a small air tight container until firm, or place in a rough log shape at one end of a large sheet of wax paper on top of a layer of foil (kind of like this). Roll into a log, twisting or pinching the ends as you go, to form a cylinder. Multiply ingredient quantities for as many sandwiches as you need. Whisk egg(s) well with a splash of milk plus pepper and set aside. Have all other ingredients out and ready to go. While heating a dry nonstick or well seasoned cast iron skillet over medium, halve biscuit(s) and spread each half generously with mayonnaise. Toast cut side down in hot pan until browned and warm, about 3 to 5 minutes. Set biscuits face up on plates or a cutting board and spread with a little garlic chive butter. 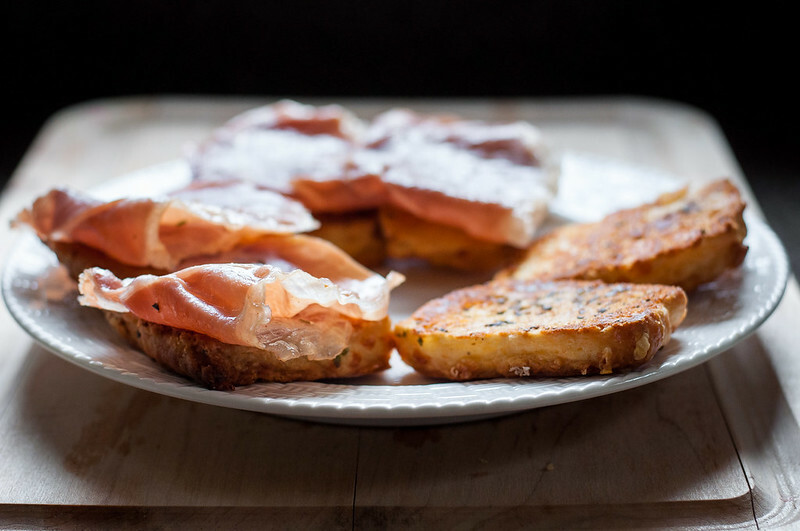 Turn heat down slightly and cook prosciutto slices for a minute or two on each side in a single layer, until slightly rendered and warm, but still pliable. Arrange one slice on each biscuit half (two slices per sandwich). Add remaining garlic chive butter to skillet. Once melted, pour in egg(s) and cook until beginning to set. Use a spatula to divide roughly to the size of each sandwich, then flip pieces over and cook until done. Salt lightly if desired, keeping in mind the garlic salt in the butter. 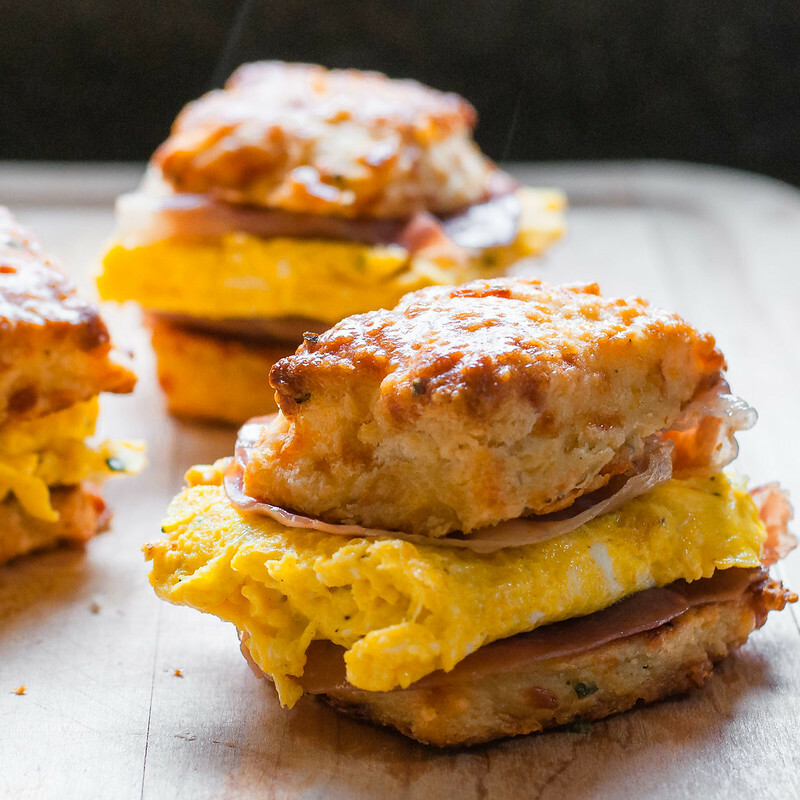 Place fried eggs on each biscuit bottom, stacking remaining prosciutto and biscuit tops to form sandwiches. Serve immediately (keep warm on a covered tray or plate in a low oven if you're making a lot of sandwiches). Biscuit recipe barely adapted from Ina Garten. Mayonnaise browns the biscuits really nicely, but you can also use butter. Being Southern, naturally, I LOVE biscuits. And I know a good biscuit when I see one. THIS is the dictionary definition of a good biscuit! And that garlic chive butter looks just downright delicious! Being Southern, naturally, I LOVE biscuits. And I know a good biscuit when I see one. THIS is the dictionary definition of a good biscuit! And that garlic chive butter looks just downright delicious! Thanks for sharing, Tessa!